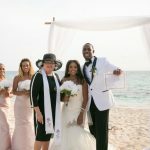 Not too late for your Summer Cayman Beach Wedding! This couple from Atlanta, staying at the Ritz Carlton, contacted me a few weeks ago before they even booked their flight. 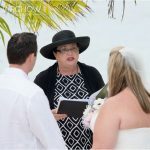 They wanted to be sure I had this slot free for their simple, Cayman beach wedding. 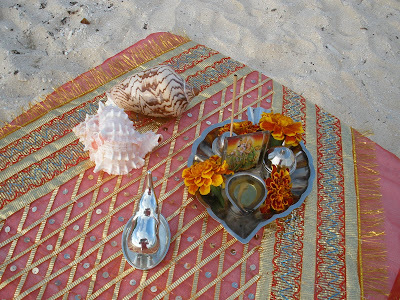 They had had a traditional Hindu wedding , and they wanted to combine their Cayman honeymoon with the legal part of their marriage. When you hire a local co-ordinator for your Destination Wedding you are able to leverage on the spot knowledge of what will work for you. On the busy Constitution long weekend when residents flock to Seven Mile Beach, I was still able to find a quiet spot which fit this couple's photography requirements. Every wedding is different, and in this case I personalised the couple's vows to reflect their Hindu heritage. Just a small touch, but one which meant a lot to the couple. In the present economy couples are looking for ways to save on their wedding. Please note that once I quote you a price for your Cayman Islands wedding, I will stick to it. I have no hidden charges in my pricing. I give you professional service and I expect to be given professional courtesy. 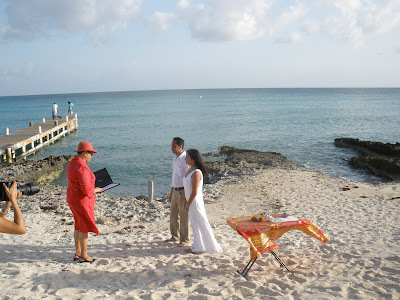 In the Cayman Islands wedding market today, couples can benefit from many specials. 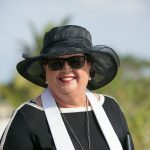 For example, Cayman Airways, www.caymanairways.com is offering several specials, including "Kids Fly Free", from its US gateways, Chicago, New York, Washington DC, Miami and Tampa. Many local hotels are offering complementary "Kids Stay Free" and "Kids Eat Free" specials. This summer is a great time for Encore Weddings, where kids are involved. I realise that couples are booking later, especially if they are having a "weddingmoon" (wedding and honeymoon combination.) 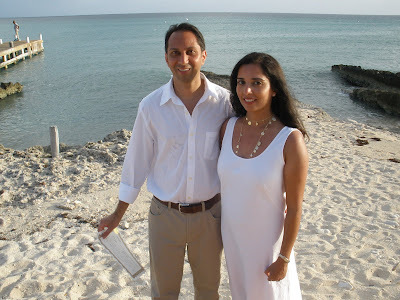 These days couples are booking sometimes a few weeks rather than months before they are due to arrive in Grand Cayman. This is not really a problem, except if I am already booked for that date, so building in some leeway is better. 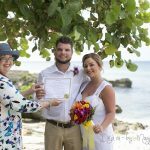 Since I am both an officiant and a planner, I can take care of all the legal requirements for your Grand Cayman wedding, if if you are using another planner. I can't stress too strongly to brides, don't try and pull off a destination wedding without a planner or co-ordinator, this is a small price to pay for a stress-free wedding day.